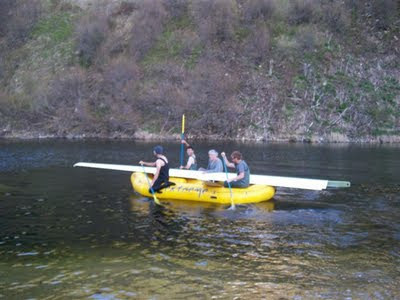 Dad is 3rd from the left, floating the wing across the lake. My dad is awesome. I got an email from him tonight letting me know he was sending me some money for Pearl's education fund. He will never know how much I appreciate this. He paid for my college education which was unbelievably generous of him. I worked hard and I use my education daily just to show him how much I appreciated it. He instilled in me the idea of loving what you do. And I do. He gave me some money for Pearl a few years ago and with Mark's help we started an investment fund for her. I was putting money away every month and when the economy slowed down I eased up a bit but never stopped putting the money away even though it presented a small hardship. I see it as an invaluable investment in her future. My dad is 82 now and he still works a few days a week. 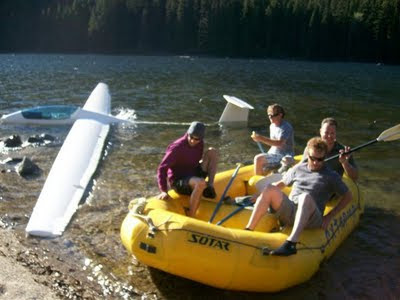 I am including some pictures here of him with his glider after he crash landed it in a lake near Pemberton BC in May. He was unhurt and the glider is getting fixed. He was excited about the whole experience, not deterred or frightened. I strive to be like him, excited by all aspects of life, open to experiences, willing to work hard for what you want and believe in. Anything less is just a waste of time. I am one lucky girl to have someone like this in my life. In between trips to the Fair, meetings in town, a little graphic design and being a mom I printed a letterpress job I have had in the works for a few months. Circumstances beyond my control delayed the whole thing. This economic slow down is hard on everyone especially my small paper supplier in Los Angeles. I have been buying paper from the same guy since 1985 when I first discovered letterpress printing at The Otis College of Art and Design, then the Otis/Parsons College of Design (A Division of the New School for Social Research. Try saying that after a few beers). The paper store is over on 7th, a block and half from the old location of Otis at Grand and Wilshire Blvd. It's a dusty one man shop specializing in printers papers. Business is slow and in order to keep it all going the owner has to gang up his orders to meet the delivery minimums. I guess I could buy paper elsewhere but nostalgia forces me to get it from this guy. When I call him up I can imagine the store, the quality of the air, the angle of the sun in the sky, the deserted street out front, the lake at MacArthur Park so nearby. So I put up with the 4 week delivery time and the half orders in lieu of full orders. The above/below pictured cards are the result of a few weeks of design, a couple hours of production and thanks to the spiffiness of the polymer plate 1 hour of printing. It was at least 80°F in the studio on Thursday afternoon when I was printing. It seems that if it's hot I am compelled to either bake or letterpress print. It was like this in LA too when I used to print in my friend Rebecca Chamlee's garage. It was eternally hot. I am quite pleased with the results on this job. I liked the design even though it was highly influenced by the client. Birds are not really in my visual vocabulary, chickens yes, birds no. I find them a bit over used by the young. I redrew the sample he sent and added the power lines because I knew they would look nice pressed into the news board under the logo. I actually took out a bit of the packing on the press because I was hitting the plate too hard and the fine knocked out type was filling in a bit. The newsboard is thick and can take a heavy hit but in some cases just a light kiss of pressure is more appropriate. Sadly my rollers are not what they could be and the impression is a bit uneven from top to bottom. My set screws are stripped I fear, the ones that hold the rubber rollers at the exact height. Anyway...blah blah blah. One day I will point Mark in the direction of the old girl and get him to detail her within an inch of her life. For now I am happy to print and live with the results which are probably finer than I let on. I love my press, I love the process of printing, I love dinking around with it, cranking the timpin back and forth, walking miles side to side. It reminds me of art school, of hot Los Angeles days when I was young and learning how to awaken what was asleep inside me. Summer is winding down. Two weeks to go until school begins. A week ago I could feel the cool underneath the warm afternoon air, the leaves are starting to drop from the trees. We are having a mini heat wave, the last gasp of a perfect summer season. The air tonight, as I walked the dogs was thick and still. All the smells hung in defined spaces too heavy to move, even the dogs who usually charge out to meet us barking, came slowly as if walking in cement. The good smells of berries and skunk cabbage were stronger and the noxious smells of silage and fabric softener wafting from neighbors trailer homes made me hold my breath as I passed. We went to the Fair last night an annual late summer ritual. It was just Pearl and I this year. I was worried we might not have as much fun on our own but we had the most fun we've had in years. I was surprisingly relaxed and in the moment and she was content with the agreements we had made ahead of time about, food and rides, and the budget. This was the first year we rode the big rides, and not just the Ferris Wheel which I explained to Pearl was just a baby ride on a grand scale. 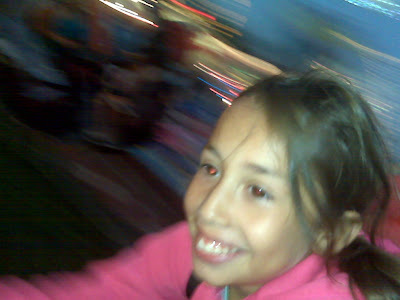 She is a dedicated fan of spinning around and really dug the Sizzler, Tornado and especially the Tilt A Whirl, she rode it twice. I laughed hysterically on all of them, letting my body relax into the centrifugal force, closing my eyes I felt like I was spinning upside down. We stayed until after dark, ambling back to our car eating Poffertjes off a toothpick with a fancy cellophane end, Pearl chattering away about all we'd experienced in the course of 5 hours and $60. Here's a poster I designed last week after finishing the second pass of book for Rockport Publishers. It's always a mixed bag here at the DoubleM. My attitude has long been that I am happy to design anything for a buck. I have said it in different, more colorful ways over the years but it always rings true. A few weeks ago I even designed some labels in exchange for Raspberries. Food is as good as cash in my world, Pearl loves frozen Raspberries and I am wholy dedicated to providing for my little tribe of one. I'm lucky, I like what I do, I have autonomy and independence. Sometimes I go without things but I generally choose to focus on what I have a lot of and right now I have a nice amount of work and many happy clients. I had a meeting the other day with a client collaborator and at the end of the meeting she hugged me and I thought how great is this, I get to do what I want, I am adequately compensated and occasionally I get hugged. Life is really good when you stop and think about it. I have been meaning to blog but haven't. Have not had a lot compelling or even funny to say. I can usually fall back on funny. Life is good. The heat wave ended and it rained but that was okay. It was sunny again today and really humid. My car windows are all broken which was awful because the dog got into something nasty and had the worst farts. It's late and I want to lay down and watch the final episode of Mad Men Season 1 in preparation for the 3rd season which begins this Saturday, so in lieu of actually writing which demands actual thinking I am posting my horoscope, which I feel explains everything. You are currently getting more miles per gallon and more bang for the buck than you have in a long time. Your IQ is creeping higher. Your knack for scoring good parking places is at a peak. I'll even go so far as to say that it's been quite a while since you've been teased by such thoroughly useful temptations. And get this, Sagittarius: I suspect that you have an enhanced instinct for taking smart risks. The only downside of all this good news is that you may not know your own strength. That means you should test it fast; find out more about its potential. Otherwise, you might break someone's heart by accident, or prematurely shatter the illusions of a person who's not yet ready to stop living in fantasyland. http://www.freewillastrology.com/ Thanks Bob, Thanks Susan. This has been a summer of setting and realizing goals large and small, old and new. One of the old small goals was to sleep outdoors on the deck of my dad's cottage on Keats Island in Howe Sound. This seems like a simple enough goal but I have not been able to achieve it for several years. I blame Mark mostly because when we go to Keats together he's not super keen on sleeping outside and I never feel like sleeping out by myself if he is in close proximity to me. Sleeping together, because we don't live together, is one of the sweet pleasures of the time we do spend with each other. But this week found me up at Keats without Mark, so I grabbed the opportunity to sleep outside. With Pearl safely installed in dad's room with Luna sleeping at her feet and my very competent sister in the next room I went out and made my bed under the eaves on the daybed. I'd like to say the experience was divine but it wasn't entirely. It was a hot still night, there were mosquitoes so I had to keep my sheet over my head which made stargazing a bit tricky. I was a little nervous about being attacked, or worse licked, by rogue Raccoons who only two nights earlier had kept my sister awake as they broke into the old time food safe to steal some dogfood that was stored there. I woke up around 2:30 because I was dying to pee which I did at the edge of the deck and then tossed and turned dodging dive bombing mosquitoes until the recently relentless sun woke me up at 5:30 or so. Strangely though, when I woke up in the morning I felt exceptionally good. Not just because I had fallen asleep listening to the water lap along the beach or because the stars shone brightly in the summer night sky. I felt good because I had finally achieved this small thing that I had wanted to do since my dad, many years ago, slept on an older version of the this same deck with his star chart and flashlight, trying to figure out his position in the universe.